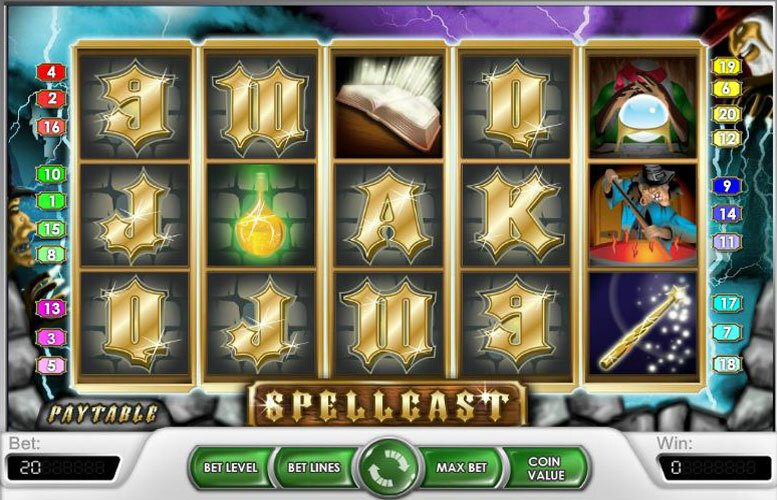 Spellcast is a 5 reel and 20 payline slot machine, made by NetEnt, which offers players a maximum jackpot prize of 30,000 coins. It’s got a 96% return to player percentage and the chance to trigger free spin rounds with a x3 multiplier attached to all winnings! Spellcast is a 5-reel, 20-line game and the theme is that of wizards, witches and magic. The background has a witch in the bottom left corner and a wizard in the upper right, with lightning all around the rest of the border of the game screen. The lightning is pretty funky looking, though other than that, the graphics aren’t all that special. The design of the 9-Ace icons are untie and about the best we’ve come across though. Enough about what it looks like, lets face it we’re all here for payouts, this slot game has a max jackpot of 30,000 coins, a scatter which allows you to win free spins where winnings are multiplied by x3 and a wild which helps with making other winning combinations. There is no bonus game in Spellcast which is a shame but that’s about all it’s lacking. In Spellcast, there is no progressive jackpot, but there is a top prize, and that prize is 30,000 coins. As with most games, you get this top prize by getting 5 Wilds on a payline, in this case the symbol is a Wizard, wearing a black hat and having a white beard. However you must do this during free spin rounds where wins are tripled as during regular gameplay it will only pay 10,000 coins. The other symbols in this game are listed with set values. They are listed with highest and lowest payouts given. Scatter – 5 Scatters (wizard concentrating over crystal ball) will win you 500 times your total bet, while 2 will win you 2 times your total bet. Castle – 5 Castles on a payline win you 750 (multiplied by bet level, then multiplied by coin value), while 2 Castles will pay out 3. Witch- This ugly spell caster stirs her flaming cauldron and will pay you 500 for 5 on a payline and 2 for 2 on a payline. Potion Bottle- 5 of these glowing Potions will pay out 500 for 5 on a payline and 15 for 3. Spell Book- 5 Spell Books on a payline wins you 250 and 3 wins you 10. Magic Wand- This spell casting wand pays you 250 for 5 on a payline and 10 for 3. Ace- 5 Aces pays you 200 for 5 of a kind on a payline and 10 for 3 on a payline. King- 150 is the win for 5 Kings on a payline while 5 is the prize for 3 of them. Queen- 125 is the win for 5 Queens on a payline, while 5 is the payout for 3. Jack- 5 Jacks on a payline gets you 125 and 3 on a payline gets you 5. Ten- Just like the Queen and Jack, you will win 125 for 5 on a payline and 5 for 3 on a payline. Nine- Nines are the lowest paying symbols in Spellcast, with the prize for 5 of a kind on a payline being 100, and 2 is the payout for 2 on a payline. Now, we move on to the betting limits in Spellcast. 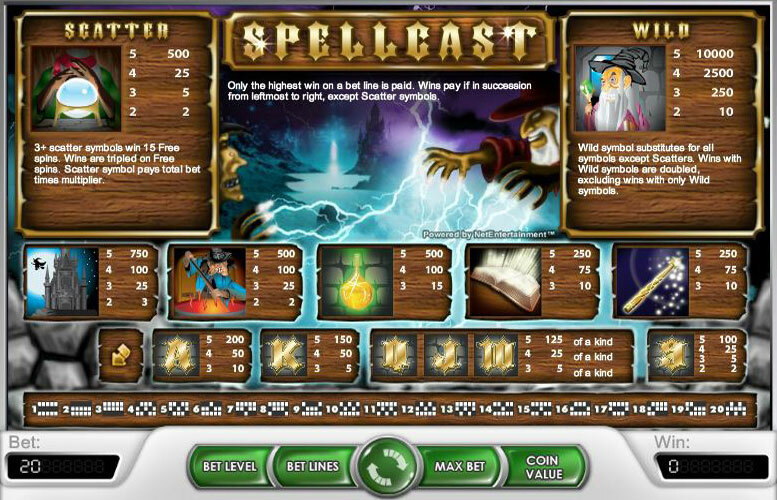 The betting limits for Spellcast are controlled by three elements; bet level, coin value and bet lines. Bet levels run from 1-4. The values per coin bet are 0.02, 0.05, 0.10, 0.20, and a max of 0.50. With all 20 lines bet on, 4 coins per line, and coin value being 0.50 cents, the maximum bet per spin is 40. This isn’t very much when compared with other games, but if you have a good streak of profiting payouts, then that won’t matter very much at all. The minimum possible bet amount for this slot would be just 0.01 per spin if you turn the coin value and bet level right down and then only play one payline per spin. To cover all paylines the min bet would be 0.20 so it’s a game well suited to low and mid-stake players. If the theme of wizards and witches catches your attention, then this game could be enjoyable for you. Have fun and good luck. This game has a rating of 2 / 5 with 235 total reviews by the users.